Spartan Shipping, Inc. has been providing shipping services to Jamaica since 1980. We have earned the reputation of having safe hands. While in our warehouse and from our warehouse to the port, we handle your cargo with care. Spartan has two locations in Florida ready to offer customers the best convenience in shipping personal effects and commercial items. This includes our main warehouse in Miami Dade which facilitates easy storage of cargo and efficient access to the Miami Port. 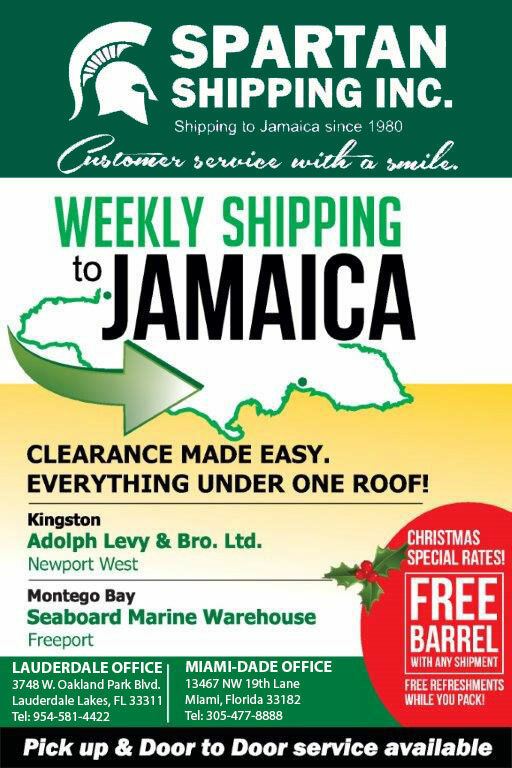 All cargo to Jamaica is consolidated on a weekly basis for shipment to Jamaica to Kingston and Montego Bay. We also handle bookings and coordinate the shipment of cargo to neighboring islands in the Caribbean. Our additional service offer includes the provision of packaging material such as boxes, barrels, crates, bubble wrapping for the protection of your cargo. Spartan Shipping will make arrangements for the pick-up of your cargo. Items will be delivered and stored temporarily at our warehouse until ready for delivery. We also coordinate with your suppliers for the pickup and drop off of commercial cargo to our locations.